I have never done a general life round up post like this before but I thought it would be a nice way to give you a little insight into my boring little corner of the world and let you get to know the girl behind the blog a little more. I love reading general catch-up posts like this that go beyond mere monthly makeup favourites. I'm going to make a concerted effort to take some time at the end of every month and just summarise the good, the bad and the ugly. Overall July was a lovely month, recovered nicely from the exam marathon that was the whole month of June and enjoyed some time with friends and family before coming back to the office after study leave of almost four months. Anything but the World Cup! I've really been enjoying catching up on my TV again. Pretty Little Liars is back for the fifth series now and I am still glued to it trying to figure out who the heck is "A"- my opinion on this changes like the wind. I caught up on one of my favourite series that I missed out on over the last few months- The Originals- and I watched about ten episodes over the course of a few days because every episode ended with some drama and I couldn't wait to see if the Klaley baby would be born in one piece. I went to the cinema to see The Fault in our Stars after having struggled through the book earlier on this year- I regretted going to see that. I haven't been hugely inclined to read books over the last month because I am enjoying not having to devour books of any time but I have been catching up with my favourite mags and I feel sufficiently incorporated in society again. I've just started Rhonda Byrne's The Secret so I will report back on that next month. I've been catching up on my favourite bloggers and Youtubers over the last month also. I haven't really been sticking to Slimming World and I haven't been to a meeting in over a month. I'm a bad slimmer! I guess I don't do things if I feel like I am wasting my time and chopping up veg and counting syns was not how I really wanted to spend my holidays, and it was the last thing on my mind when I was actually doing exams. I've still tried to make healthy choices where possible but I have allowed myself treats too- I feel like I deserved them. Fully intending to get my Slimming World mojo back asap and get back to my fatbusting ways again soon. I've been cooking lots over the last month and getting lots of recipes from the Slimming World Fakeaways Book- Thai Red Curry is an adaptation of one of the recipes but it's delicious. I've also loved nectarines and strawberries this month (that time of the year again! ), and I've been on a real Maltesers kick recently too. I've enjoyed a few meals out in Cork and Dublin over the last month- all nice but nothing to write home about at this time. 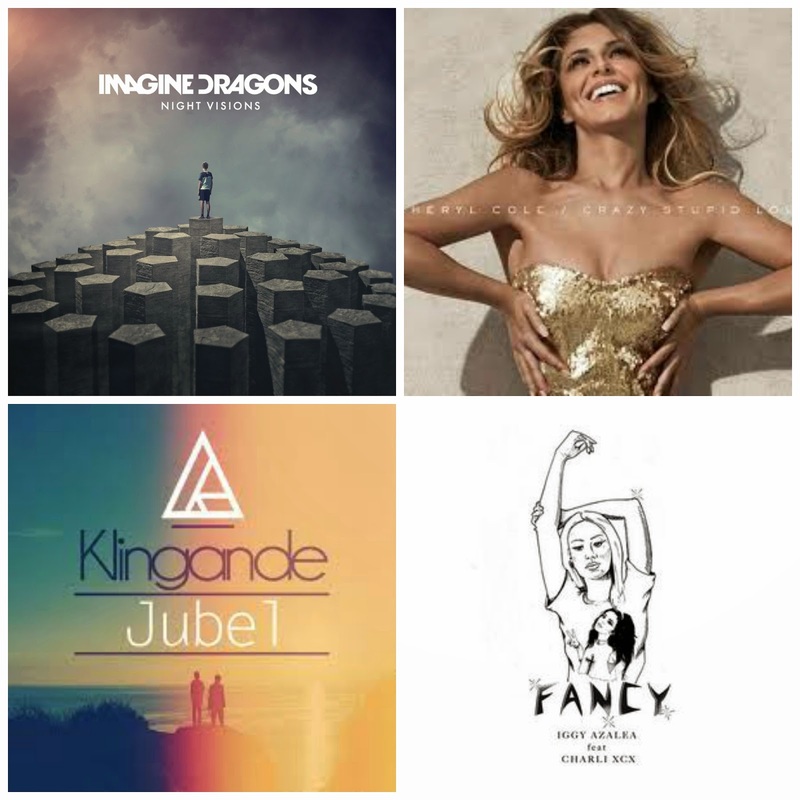 The month started off terribly and I wasn't really feeling any music- however, I've had a bit of a musical epiphany over the last few weeks. The Imagine Dragons Night Visions album is absolutely fantastic and I'm only sorry I didn't pick it up sooner. In the charts I've been loving Ella Henderson's Ghost, Iggy Azalea's Fancy, Rita Ora I Will Never Let You Down and Clean Bandit Rather Be. I'm embarrassed to admit that I actually find Cheryl Whateverhersurnameisnow's Crazy Stupid Love incredibly catchy and it's stuck on repeat in my head. My song of the month is probably Klingande's Jubel- I think the saxophone is the only instrument that can successfully replace lyrics in a song and this song backs up my opinion. When I am in a great mood, the saxophone puts wind in my wings, and when I am sad/angry, that same saxophone sounds like it is experiencing my anguish. Pretty much chilling. I got my hair cut at the beginning of the month but I'm still on the fence as to what I want to do with the colour. Getting my hair cut makes me feel great, especially given like it grows like a beast and is pretty dry despite my best efforts. I had two and a half weeks of free time in between my exams and starting back in the office and I thoroughly enjoyed the break. Not only did I sort out my entire makeup collection (it didn't take me hours, it took me days! ), I got to catch up with loads of friends and family and the doggies. Audrey of The Nail Affair, Anne Marie of Girlfridays Beauty Blog, Anne Marie's Australian cousin Dani and I all had a lovely brunch in Douglas & Kaldi in Dundrum Town Centre and it was nice to catch up with two of my favourite ladies. I can't remember the last time I had such an extended period of free time and whilst it was great whilst it lasted, I was looking forward to getting back into the routine of work. 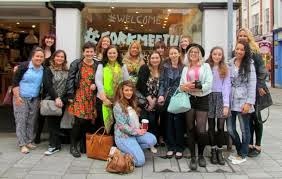 I attended the Cork Meetup (#corkmeetup) a couple of weeks ago and had a fantastic day- got to meet loads of lovely bloggers from my neck of the woods (YES I am a proud Corkonian- county not city!). It was a lovely day, we were spoiled by many companies with treasure trails and demos and show and tells. It was one of the best events of my blogging, eh, career to date and was great to meet so many girls from Twitter in the flesh. I also went on a little road trip to Killarney and it honestly melts my heart and makes me so proud to be Irish when I see the mountains and lakes of Kerry. I also attended three events in Dublin over the course of July- Oriflame hosted an event to celebrate the launch of 'The One' in the Gresham at the start of the month and we got to meet Gary Cockerill. I attended the Giorgio Armani Eye and Brow Maestro preview with Eoin Whelan and the preview of the new YSL Le Teint Encre de Peau/Fusion Ink foundation with Fred Letailleur. All very glamorous and exciting. And when my holidays were over, I came back to the office to a new department (Technology- ooh!). It's great to be back, I missed everyone over the last few months and I missed daily life in the office. There is something to be said for routine, and I really enjoy my job so it's not that much of a chore really! Also, we had a team away day last Friday which was just awesome and a real icebreaker in getting to know my new work colleagues. We went to pitch and putting and for a bite to eat and a few jars in Johnnie Foxes and got a party bus there and back, before coming back into town and popping into our usual Friday haunt for a beverage. So.much.makeup. It's criminal how much makeup I have bought this month, but I always find it so easy to justify makeup shopping after exams- it feels like a treat to myself for a job well done. I finally bit the bullet and bought the Hourglass Ambient Lighting palette that I've been lusting after for months. I was finally able to purchase the Clinique Take the Day Off Cleansing Balm (this was just never in stock anywhere). I bought a new YSL Rouge Volupte Shine in 19 Fuchsia In Rage after setting my eyes on it in House of Fraser. As part of #corkmeetup, I was generously gifted with a voucher from Debenhams on Patrick Street, Cork and I used my voucher to pick up the Urban Decay Flushed Palette in Streak and another YSL Rouge Volupte. Manfriend very kindly transported me to Santry to get some more NYX goodies. Avril enabled to me to buy the Wet Brush and the Shine Brush at the end of the month and I also picked up some pieces from No.7 with those vouchers they give out. Next month I'll have to cut the shopping a bit and start shopping my stash because I found many treasures when sorting through my makeup collection and I honestly don't actually need anything. My insatiable makeup curiosity will bankrupt me haha! I didn't do much sales shopping this year but I did swing by Next and got some new bits and pieces for the office- have to say though, the selection was not great. I picked up a new handbag and necklace from Zara and I have worn these loads since I got them. I also popped into Penneys for a look and bought new bedclothes and some bargains in the sales. I also finally took the plunge and treated myself to a new set of Ray Bans. Not the most glamorous or girly of glasses to be sure, but I needed something to banish the sun's rays from my delicate little eyes. Hoping that these will be an investment and that they won't break like all my other designer sunglasses have done over the years. Best hairsprays for Summer Styles. Makeup wise, the Benefit Push-Up Gel Liner is my new favourite eyeliner. The entire Charles Worthington Salon at Home haircare line. Playing Sudoku. Puppy cuddles. Day trips. Making new friends. New bedclothes. Debenhams. Air conditioning. A happy, healthy Nana. Sudoku. Coconut rice. Irish strawberries. Saxophones. Joan Burton becoming Tánaiste. Grown men crying over the Germany v Brazil match. Irish weather. Excessive negativia on Facebook. Unfortunately, despite having only gotten home on the June bank holiday weekend, Manfriend was ordered back to his ship in the middle of July, which came as a complete shock to us both- we were under the impression that he had another six weeks' leave. So that was a bit of a downer in what was otherwise a great month and he headed off the South Africa to join the boat almost a fortnight ago now. Hopefully he will be home for Christmas this year. The entire situation in Gaza is just terrifying and the pictures in the news scare the life out of me. I'm also feeling a bit glum about the thought of going on a long haul flight any time soon with three major airplane crashes that I know of killing hundreds of people in the last few months. Powder Pocket ceasing all operations effective immediately. I could kind of see it coming because the quality of the boxes declined as the months dwindled but I still don't like to see an Irish business failing. Not being able to find a Physician's Formula stockist yet. I *just* need a bronzer. Luas at rush hour. The newspaper reporting during the period where a man stood on the roof of a building in Dublin for a few hours. The insect that bit me twice, cause my arm to swell and made my Mummy think that I had contracted malaria. Not being able to find a copy of Glamour Magazine with a Chubby stick in Ireland. My phone is still being a brat and despite numerous calls to Meteor and popping instore for a new SIM card, it's not getting much better. I don't particularly want to upgrade to the iPhone 5S because the battery is even more shocking than the 4S by all accounts. I just cannot rely on my phone at all these days which is so problematic. As little as possible, and not in the way you're thinking! I've been absolutely dying in this heat for weeks now. I think my body temperature is programmed a couple of degrees higher than everybody else anyway because I never really feel the cold even in winter which makes summer just all the more excruciating for me. I'm not and never have been a sun worshipper. I want to get a nice plant to spruce my office up a little and I'm thinking about a twin stem orchid. I need an independent plant that won't die if I forget to water it, which is very likely to happen. In July I accidentally killed a basil plant. RIP Basil the Plant. I have a 1950s Rockabilly themed hen party coming up next month so trying to get an outfit together for that will be some task I'm sure. Thankfully hair and makeup is all part of the hen experience so I don't have to stress myself. I love the 1950s style so hopefully I'll be able to pull a suitable outfit together. Getting fully immersed in work again. Please let me know below what you think of these types of posts? Do you feel like you know the girl behind the blog a little better now? And now that I have dished the dirt, you have to tell me about your July too- what crazy things did you people get up to?